What are the business process standardization and harmonization in BPM? 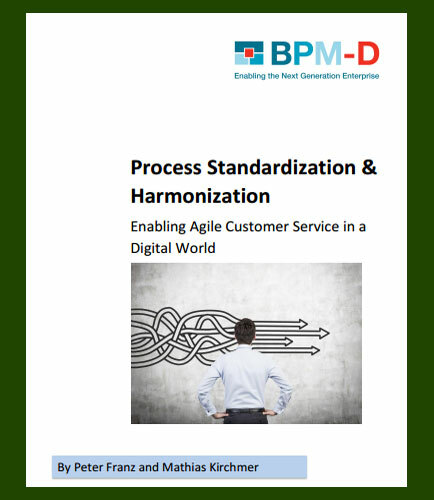 "What are the business process standardization and harmonization in BPM?" Why has standardization and harmonization in Business Process Management become so much more important in this digital world? Measuring success of standardization and harmonization initiatives has a dramatic impact on BPM enablers. But complex market conditions combined with digitally empowered consumers present a challenging commercial environment. When processes are aligned and good practices are applied, efficiencies are created, freeing people to innovate. In order to achieve this alignment and efficiency, standardization and harmonization of business processes is important. This whitepaper guides you on all five of these critical areas in the context of standardization and harmonization and actions to be taken to improve standardization and harmonization in business processes. Adopting Standard Business Processes – Fast at low risk. Process Governance, Process Knowledge Management, People Engagement.